The “Family Remodeler” describes the period when children first leave home and their parents remodel their families and redefine their lives. 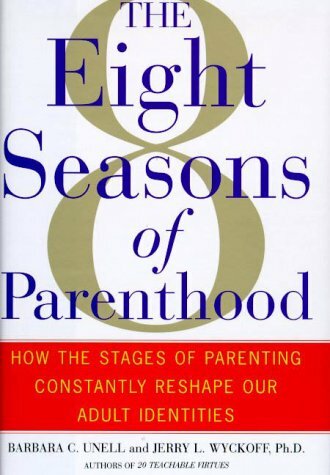 According to the authors, this period is filled with pitfalls for parents. This period is followed by the Plateau Parent season when children are fully financially independent and starting families of their own. Parents must decide how available they will be to help their children and grandchildren, and opinions between a couple can differ. They often have to deal with their own aged parents who also need help. Plateau parents relive the first circle of parenthood through their grandchildren. Many plateau parents feel closer to their adult children as a result of becoming grandparents. The authors state that it is critical that Plateau parents be aware of the old wounds they may have inflicted upon their own children. Their adult children will remember how critical they were of them as youngsters and may have difficulty spending time with them when they become parents for fear of further criticism. According to the authors, the parents who were most successful in this season had limited their roles in their adult children’s lives; they made a point of keeping some distance between themselves and their children, offering them invitations and letting their children come to them. The final season, the dependent “Rebounder” can last for just a few weeks or for years if parents gradually lose their ability to be an independent. ( Personally, I’m hoping it lasts a day.) Rebounders constantly wait for signs that they are needed, wanted and special. The best of the Rebounders strive to maintain their independence but are willing to ask for help and feel grateful for it. They neither refuse to accept help when offered nor refuse to ask for it when needed. They don’t act like a whining child who doesn’t get enough attention. While this book is interesting, it is based on anecdotal evidence, not statistical research. In addition, it assumes a Northern European family model and would not be as useful to those who come from other cultures with different family expectations. But those factors do not stop it from providing insight into the challenges parents face as they pass through different stages of their children’s lives. I see a lot of interest and value in this book, given your summary. It reminded me of some issues that come up in therapy with adults who have adult children and with adult children who are new parents. In the latter case, the adult children may be seeing their parents being ‘better grandparents’ than they were parents, and there may be some bittersweetness to this. Many interesting intergenerational conversations may arise! Where adult children have arrived at somewhat of a peer status with their parents, it is often useful to ask a member of the older generation how they could benefit from the counsel from the younger generation person: we want our children to be open to our influence; how about we be open to their influence? Thanks for your comments Midge. I love learning from my adult kids and they and their friends sure have a lot to teach me. It means surrendering some parental power and demonstrating vulnerability, but I like doing that anyway.